C. M. Stewart replied quickly to the 10 December 1914 response to his letter from the Bureau of Pensions. In fact, five days after the Bureau of Pensions wrote to him in North Liberty, Iowa, he was crafting his letter full of information back to them. 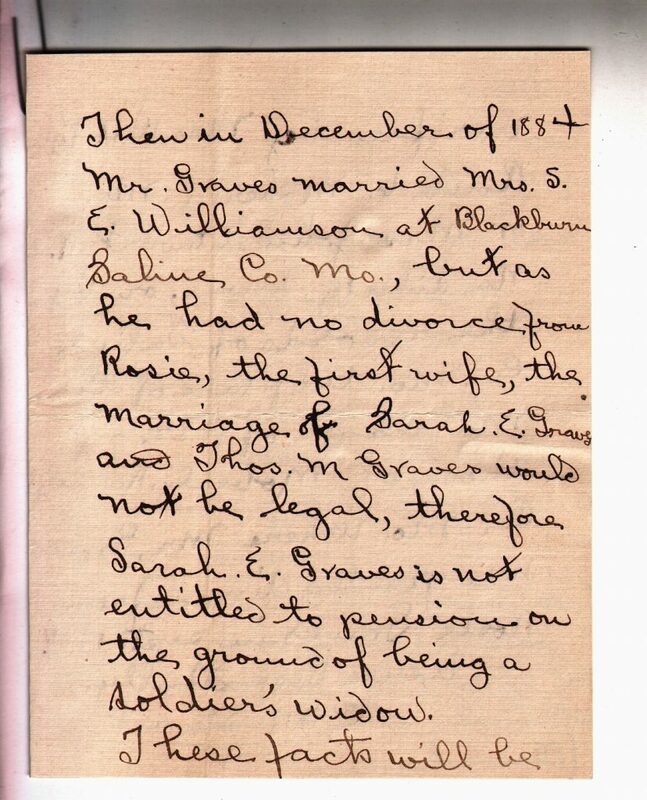 C. M. Stewart gave details about Thomas M. Graves’ life after his Civil War service–with the intention of keeping Thomas’ wife, Sarah, from getting his pension. Since Sarah never applied for a pension based on Thomas’ service, there is no followup in the pension file to any of the statements made in Stewart’s claim. 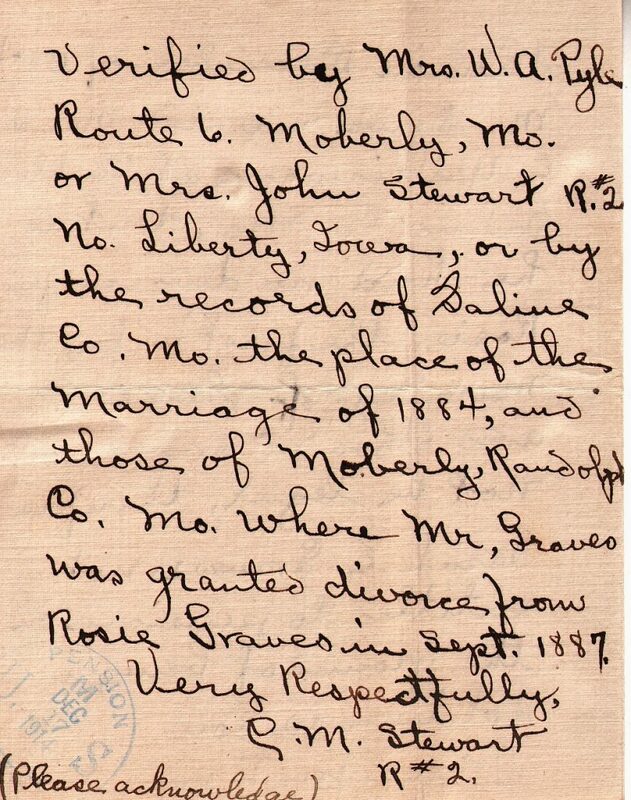 Stewart states that Thomas Graves was married to Rosie (Dix) Graves and that “after a quarrel” they separated in 1882. In December of 1884, Thomas married “Mrs. S. E. Williamson” at Blackburn, Saline County, Missouri. At the time Thomas was not divorced and he did not divorce Rosie until September 1887. This divorce was apparently granted by a court in Moberly, Randolph County, Missouri. Mrs. W. A. Pyle of rural Moberly, Missouri, and Mrs. John Stewart of rural North Liberty, Iowa, would be able to “verify” the facts that C. M. Stewart stated in his letter. C. M. does not indicate what (if any) relationship there was between he and John Stewart. It seems reasonable to believe that the two women C. M. mentions had some connection to Thomas M. Graves. That connection is not stated and while the researcher may suspect what that relationship is, it’s best until further research has been conducted to leave the conclusion at “there’s probably a connection” until more records have been accessed. Stewart’s letter suggests several records that should be accessed. The 1884 divorce is the first on that list. It would also be helpful to research the women C. M. Stewart mentions in his letter. 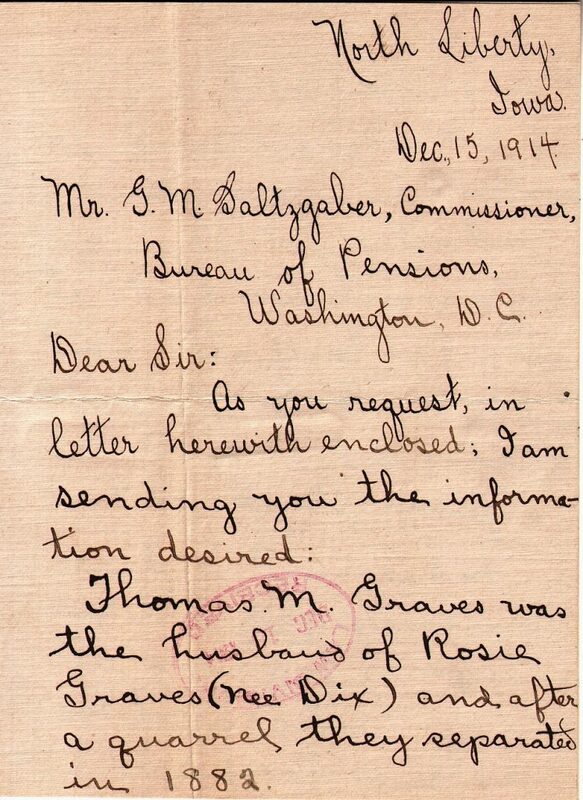 The fact that Thomas M. Grave’s widow, Sarah, never applied for a pension in his name, even though she survived him for over ten, years suggests there was some reason the application would not be approved. The vast majority of Union widows applied for pension benefits after their husband’s death. It’s difficult to know what went through Sarah’s head, but if the statements in this letter are correct, the reason seems fairly clear. Thomas M. Graves served in Company B, 42nd Missouri Infantry in the US Civil War and this letter is contained among his pension application file in those records. He’s certainly a busy body! I wonder why he hates her that much. I’m thinking that he’s related to someone who was connected to Thomas’ first wife. One of my distant relatives in East Tennessee was denied a Union Army pension at first because his lieutenant swore that he was healthy upon leaving the army. Neighbors had to step in and declare that there was a long-standing feud between the lieutenant’s family and the soldier’s, due to the soldier’s father’s third wife, identified in the pension file only as “David Acuff’s wife’s sister”. Took me years to find the marriage record & learn who she was. He did finally get the pension.